I'm still trying to decide whether I like Carlos Reygadas's Post Tenebras Lux, which played twice at the Chicago International Film Festival. I take that as a good sign. If I still can't categorize my response to a work of art after sleeping on it, then chances are it's challenging my prejudices in ways I hadn't before considered. And if the challenge proves constructive enough, then I usually end up feeling grateful for the work regardless of whether I enjoy it. Such has been my relationship with Jean-Marie Straub and Daniele Huilet's Too Early, Too Late, Michael Snow's Wavelength, and nearly every piece of music I've heard by Arnold Schoenberg. Maybe I'll feel the same way about Reygadas's new film (his first since Silent Light) after it settles in my mind. Unfortunately, the movie remains without a U.S. theatrical distributor, so I may not get to retest my impressions for a while. The film is as daring an experiment in narrative structure as Reygadas's Battle in Heaven. Every new sequence feels like the beginning of a new movie, as though the filmmaker is erasing the slate each time he moves to a new location. 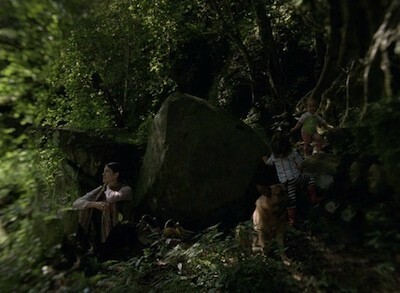 The movie begins with a remarkable sequence in which a little girl (played by the director's own daughter) wanders overwhelmed through a valley, interacting with dogs, cows, and mud puddles. Reygadas keeps the camera at her level of her perspective, about two or three feet off the ground, and conveys her wonder through odd rotoscoping effects that evoke how 3-D movies look when you take off the glasses. Much of the movie transpires in this style, which only heightens the romantic bewilderment inherent in the structure: Reygadas wants to privilege the feeling of discovery over understanding. Within half an hour or so, Post Tenebras Lux orients itself around a wealthy man who's moved with his family from the city to the Mexican countryside. Apart from some familiar (and hardly insurmountable) marital issues, he seems pretty content. At present, I can't say why his experience merits the spiritual grandeur of Reygadas's approach. Perhaps it doesn't, and the arbitrariness of focusing on this life—as opposed to those of the rural Alcoholics Anonymous members, French orgiasts, or British rugby players we meet during the movie—serves to emphasize the universal transcendence suggested by the style. And what a style it is. Like Terence Malick, Reygadas has a gift for imbuing everything he shoots with uncanny, seemingly predetermined significance while respecting the spontaneity of real life. Even when I found Post Tenebras Lux vague, perverse, or indulgent (coming out of the theater, a friend joked that its theme could be reduced to "rich people have feelings too"), I couldn't take my eyes off of it.